When using data binding, we may sometimes want to alter the data before presenting it to user, or we may want to change the appearance of something based on the value of the data. For example, assuming we are binding a date value, we may want to change its formatting, or we may want to change the background color based on whether the date is before or after the current date, or even show something special on certain dates (such as flowers on February 14th). When we bind a list of items to a control (such as GridView or ListView), we can not edit individual templates of the items. We may also be getting our data from another source, such as a webservice, so we may not have control over the data we receive. So, in order to implement the features I’ve explained on the previous paragraph, we will need to use IValueConverter interface, which provides exactly what we need. In this article, we will be developing a Windows Store application that uses the IValueConverter interface. We’ll start by opening Visual Studio and creating a new Windows Store Blank App project. I’m naming the project IValueConverterApp. For this example, we will have a list of students. Our students will have a grade between 0 and 100. Our application will display these students, but their grades will need to be in letters (between FF and AA), the item color will be different based on the grade (100 – 80 will be green, 79 – 60 will be orange, and 59 – 0 will be red), and if the grade is 100 we will put a star next to the student’s name. return "Orange";           // You can also enter hexadecimal values here. 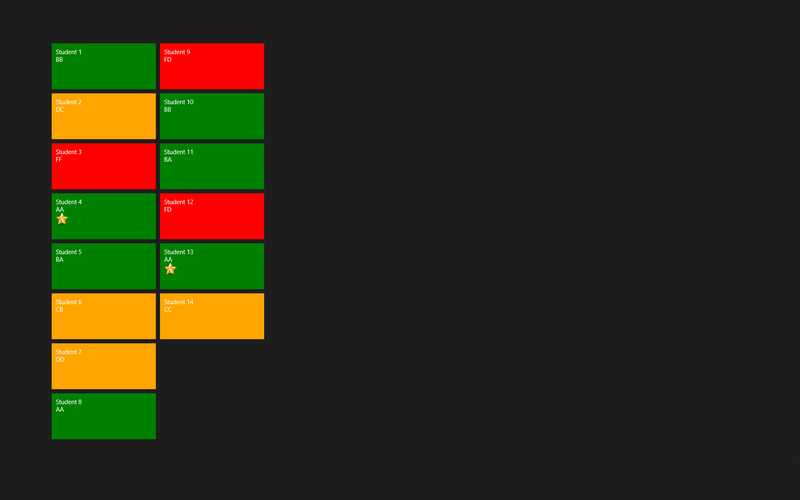 Then we will create the ItemTemplate for the GridView, and use the converters. Note that I’ve added a star image named “star.png” at this point to Images folder in the project. You can add whichever image you want. You can download the source code of the application here.